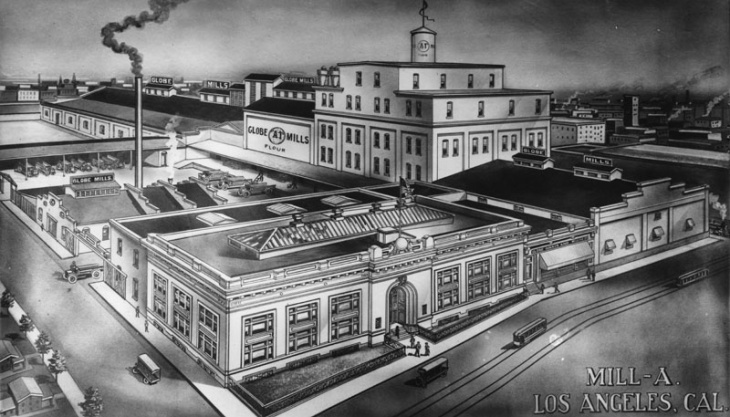 Undated drawing of the Globe Grain & Milling Co. headquarters and warehouse, at 907 E. 3rd Street in Los Angeles, now an arts district. The complex is the location for Hauser Wirth & Schimmel's new LA gallery. Paul Schimmel curated the MOCA exhibit "Destroy the Picture: Painting the Void, 1949 - 1962," his final show as the museum's chief curator. An aerial view of the plaza and the area around The Broad museum, which is under construction in downtown Los Angeles. 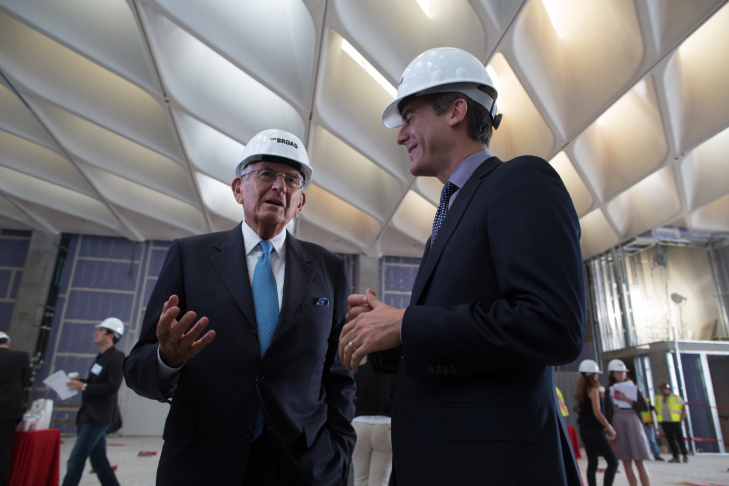 Eli Broad and Eric Garcetti talk at The Broad, a new contemporary art museum that is tentatively scheduled to open in mid-2015. Off-Ramp host John Rabe gets an update from arts reporter Jori Finkel on the Hauser Wirth & Schimmel gallery coming to the downtown Arts District and the Broad Museum coming to Grand Avenue. One's gritty; one's grand. Two new important arts spaces are coming to downtown L.A. soon, one in the Arts District that's long been the home of poor artists, another alongside Grand Avenue's grand edifices. Jori Finkel, an arts journalist currently freelancing for the New York Times, gave us an update on both this week. First, we went to 901 East 3rd Street, the site of a former flour mill. It's near the former Al's bar, a punk rock Mecca, and across the street from Wurstküche, the sausage and beer hall. The international art gallery owners Hauser & Wirth will be opening a huge new gallery here in partnership with former MOCA chief curator Paul Schimmel. 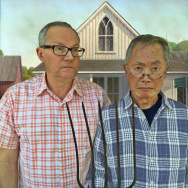 Finkel says, "A powerhouse gallery, for sure. Galleries in Zurich, New York, and London." It will be called Hauser Wirth & Schimmel. "[Schimmel] is actually a partner with them worldwide now," she says, "but this particular gallery he will be running, and we can already see his stamp on the program, because the first thing they'll be doing — maybe January of 2015 — is a pop-up gallery show to show the world what they're bringing to L.A., and it's going to be a big one." Finkel says that show will include Mark Bradford, Laura Owens, Sterling Ruby and Mary Weatherford as among the artists. Then, it'll close again and — after extensive renovations — reopen sometime in 2016 as a "gallery on the model of a museum," as Finkel puts it. "It is commercial, but they're staffing up as though it were a museum," with educational programming and some exhibits at which the art will not be for sale, she says. 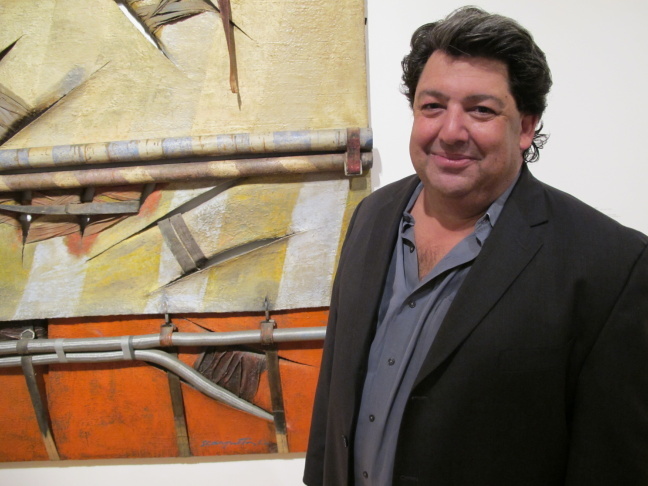 Schimmel left MOCA because he didn't get along with Jeffrey Deitch, the former high-end gallery owner brought in to direct the museum. He's since been replaced by Philippe Vergne. The question asked then, with raised eyebrows, was, "What does a gallery owner know about running a museum?" Now, it's only fair to ask, "Does Schimmel, who has spent decades in the museum world, have what it takes to run a gallery? " Finkel responds: "'Does he have what it takes to make sales?' 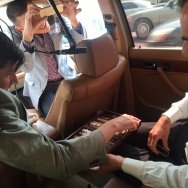 is a question I've heard other (art) dealers ask." 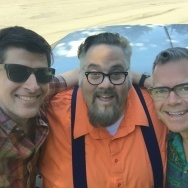 And despite the fact that he's built deep relationships with important artists, "Paul is not known for working on the service model so much. He has a big personality. People love him for that reason, and he rubs some people the wrong way for that reason." Next, it was off to Grand Avenue to check out the progress on Eli Broad's new edifice, the Broad Museum, completion of which has been delayed until at least the middle of next year, according to what Broad told Finkel. Finkel says the works inside will be the contemporary art collected by Broad and his wife Edythe and by the Broad Art Foundation. "So while you'll find some early Rauschenberg, Lichtenstein, Warhol-type works, you're also going to find some really big names of contemporary art today: Murakami, Koons, Cindy Sherman." 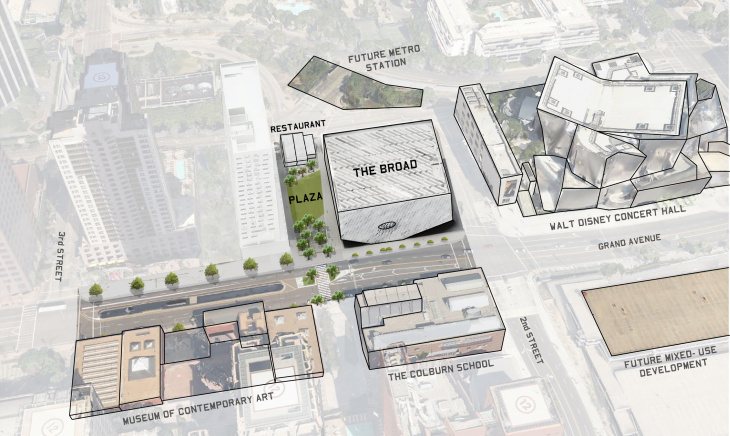 Will the Broad hurt MOCA, which is almost across the street? Finkel says she doesn't think so, because MOCA has struggled with low attendance, and "anything else that brings people who are art-interested or even just art-curious to this area will make this more of a destination for art. How much more is the question." Follow arts writer Jori Finkel on Twitter.